16112A - 1923 - 24 Tudor and Fordor Battery Trap Door, has a half lap joint where it meets the floor boards on the passenger's side. 16112C - 1926 - 27 Fordor Battery Trap Door, has No half lap joint and a finger hole on front edge was added. Our Quality reproduction floor boards are manufactured to fit exactly like the originals. These hardwood floorboards are exactly like the original floor boards. They are manufactured from solid Ash. Made locally in the USA. Note: The Fordor Sedan continued to use the battery trap door through the 26-27 model years. The Tudor sedan did not. 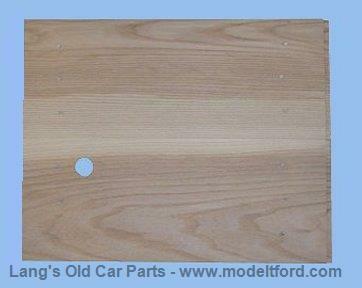 The 26-27 Tudor rear floor was covered by the rear floor board.